Subhash Chandra Parija, "Writing and Publishing a Scientific Research Paper"
This book covers all essential aspects of writing scientific research articles, presenting eighteen carefully selected titles that offer essential, “must-know” content on how to write high-quality articles. 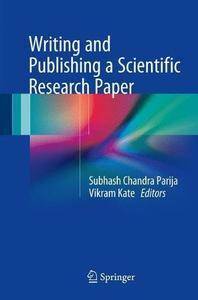 The book also addresses other, rarely discussed areas of scientific writing including dealing with rejected manuscripts, the reviewer’s perspective as to what they expect in a scientific article, plagiarism, copyright issues, and ethical standards in publishing scientific papers. Simplicity is the book’s hallmark, and it aims to provide an accessible, comprehensive and essential resource for those seeking guidance on how to publish their research work. The importance of publishing research work cannot be overemphasized. However, a major limitation in publishing work in a scientific journal is the lack of information on or experience with scientific writing and publishing. Young faculty and trainees who are starting their research career are in need of a comprehensive guide that provides all essential components of scientific writing and aids them in getting their research work published.